Ionian Islands are a complex of islands on the west coast of Greece. There are seven major islands which include Corfu, Paxi, Ithaca, Kefalonia, Kythera, Zakynthos, and Lefkada. 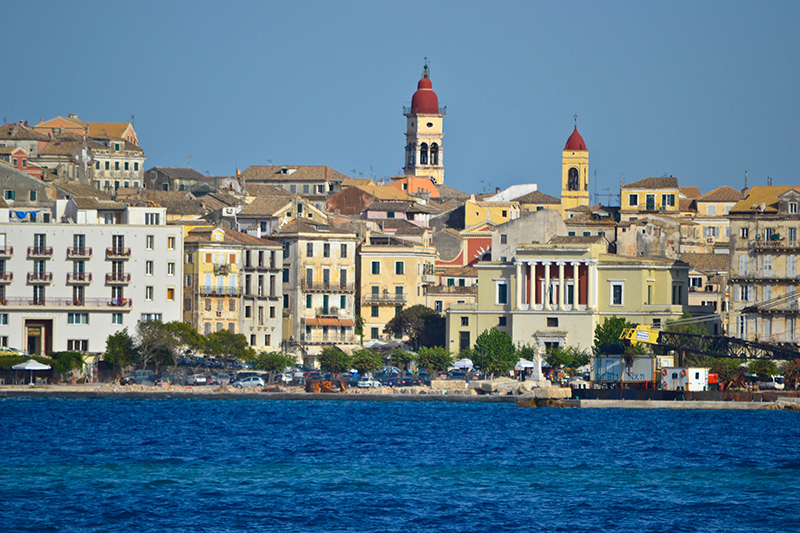 Being closer to Italy than the Greek mainland, most of the Ionian islands exude a strong influence of the Italian culture, except from Corfu, which has a distinct British touch (it was a British Protectorate in the 19th century). Corfu is a green and mountainous island located between the heel of Italy and the west coast of Greece’s mainland. It is among the most popular Greek Islands, with a long history of tourism that dates back to the 1960s. Despite the fact that it is visited by tourists, several years now, the island still holds a significant part of its beautiful landscape, which includes unspoiled sandy beaches, mountains and woodlands. Being one of the most popular destinations on the Ionian Islands, and in Greece, Corfu island offers many attractions and things to do while you are on Ionian island hopping. Some of the things you can enjoy on Corfu include exploring the peaceful streets of its Old Town, a UNESCO World Heritage site, featuring attractive Venetian-style buildings, indicating the rich history of the town. If you are fond of hiking, you can also explore the Corfu Trail, a 137 mile hiking trail that will offer you with a view of the stunning landscape of the island. Other activities include visiting its museums, water parks, horse riding or scuba diving. Why is Corfu perfect for island hopping? Corfu is a perfect destination for Ionian island hopping due to the several experiences it offers to its visitors. While you are on Corfu , you may have fun with the loud and vibrant nightlife, enjoy the delicious traditional Ionian cuisine, explore the natural wildlife and the abandoned caves, or relax in the quiet romantic sunsets at a beach. The cheap and adequate accommodation in Corfu, also makes it a perfect spot for island hopping in the Ionian. Corfu island is connected to Greece’s mainland by a ferry service that operates every day from the port of Igoumenitsa, a trip that takes about 1.5 to 2 hours. You can also reach Corfu from the mainland using a ferry from the Port of Patra, a trip that takes about 6 hours. In addition to the ferry, Corfu also features an international airport with daily flights to and from Athens. When transferring to other Ionian islands the main form of transportation is the ferry service, which connects it to nearby islands. You can also find chartered flights to Kefalonia and Zakynthos islands during the summer season. Paxi is a small Ionian island located in the Ionian Sea, south of Corfu. It is a popular destination, especially due to its wonderful beaches that have exquisite blue waters. Paxos is also well known for its exotic beaches which you can visit in the uninhabited islet of Antipaxos. As Paxi is a small island with few tourist attractions, there are still exciting things to see and do. One of the main attractions of the islands is its stunning beaches, which are considered to be some of the most beautiful beaches in Greece. 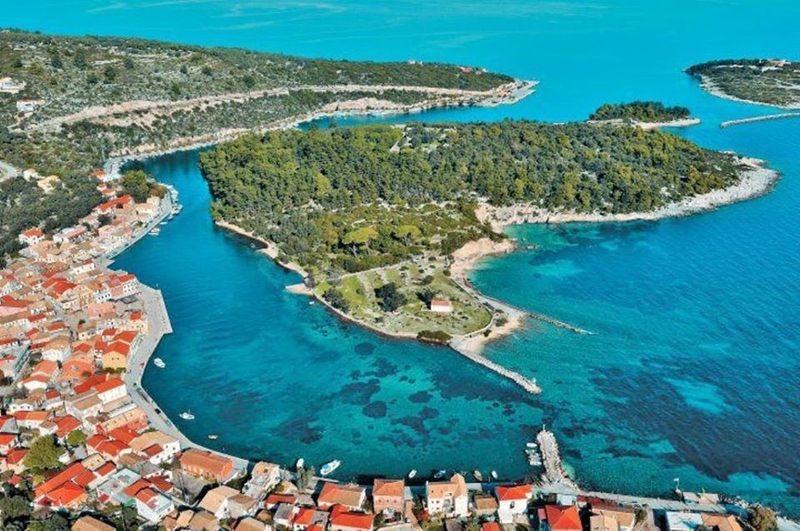 You can also explore the three main villages of the island (Gaios, Logos, and Lakka), which are surrounded by a beautiful natural landscape and dotted with monuments and buildings that feature a rich cultural heritage. Another exciting thing you can do in Paxi is to take a boat ride to the islet of Antipaxos, an exotic and uninhabited island that is famous for its natural beauty. Why should you visit Paxi? Paxi is great for people who need piece and quietness during their holidays. 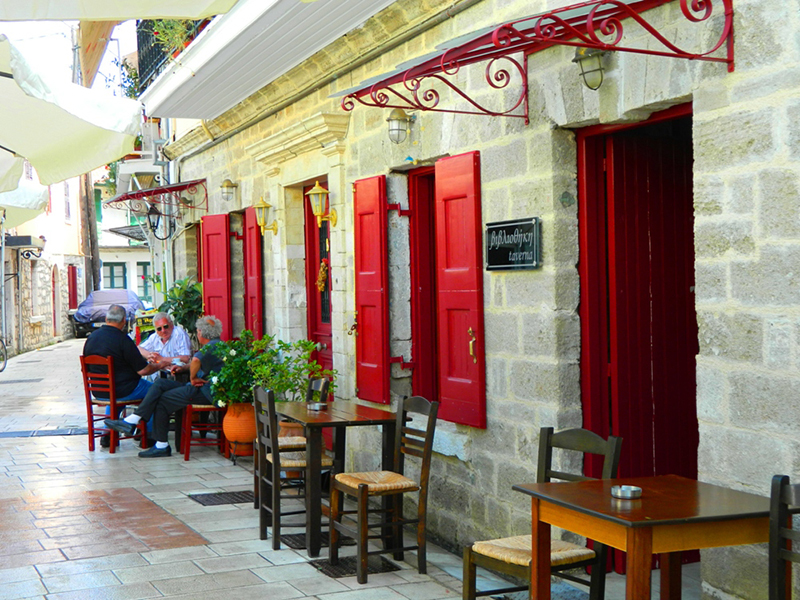 Also, the island boasts several attractions, such as traditional villages, exotic beaches, museums and churches. In addition to the attractions, Paxi is also a very cosmopolitan island, mainly due to its close proximity to the island of Corfu. All these make it a perfect destination for Ionian island hopping. Paxi do not have an airport, and therefore, the only way you can reach or leave the island is by a ferry or a boat. The most convenient way of reaching Paxi is by a hydrofoil from the island of Corfu, which takes about 30 – 45 minutes. 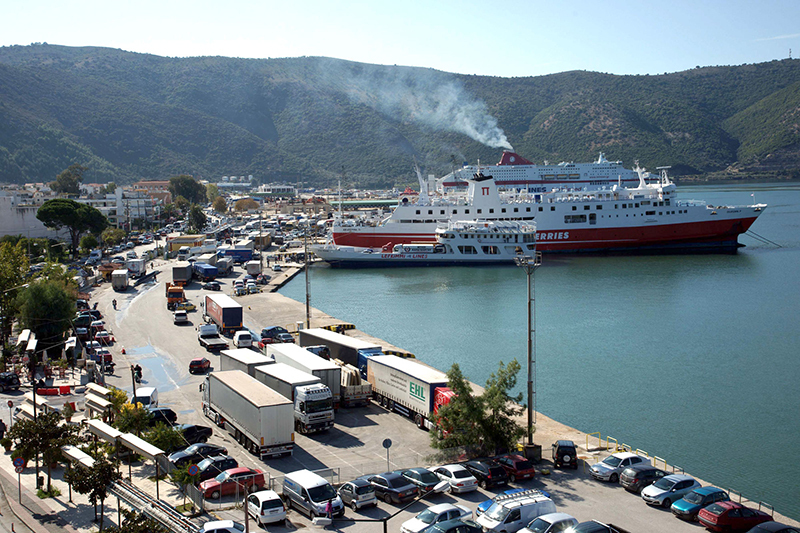 You can also reach Paxi from the mainland by taking a ferry from the port of Igoumenitsa, which takes about one and a half hours. 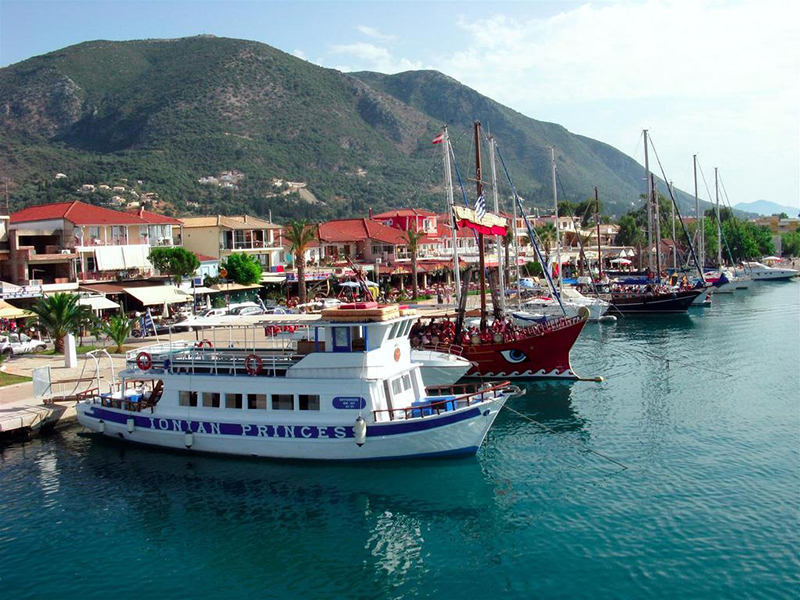 When leaving the island, you can take an excursion boat to the island of Lefkada. Lefkada is one of the most beautiful islands in the Ionian, with its natural beauty coming from the stunning landscape and the exotic sandy beaches with blue waters. The island is also dotted with lovely seaside villages that are surrounded by beautiful lush green vegetation. Lefkada is one of the top destinations in the Ionian, and is full of amazing attractions and things to do. The highlight of the island is the exotic beaches, which have crystal clear blue waters. The beaches are also surrounded by steep cliff rocks, giving them a rich scenic value that attracts several tourists from all over the world every summer. Other activities include exploring the island’s villages, visiting the historical buildings such as the medieval Castle of Agia Mavra and the Monastery of Faneromeni. While exploring the island, you should also visit the gorgeous Waterfalls of Nydri, which originate from the Lefkada mountains and ends in a gorge with stunning white rocks. Why is Lefkada perfect for Ionian island hopping? One of the best things that Lefkada has to offer is the amazing exotic beaches, due to which, the island is considered the “Caribbean of Greece”. Lefkada also has an amazing nightlife, which allows you to relax and have fun after a busy day exploring the island’s several attractions and sights. The island is also an amazing destination for people who are interested in windsurfing or kite surfing. You will find quite many holiday villas in Lefkada with excellent views to serve your needs. When island hopping in Ionian, the most convenient way of getting to Lefkada is through the mainland. This can be done using a ferry from the port of Igoumenitsa. 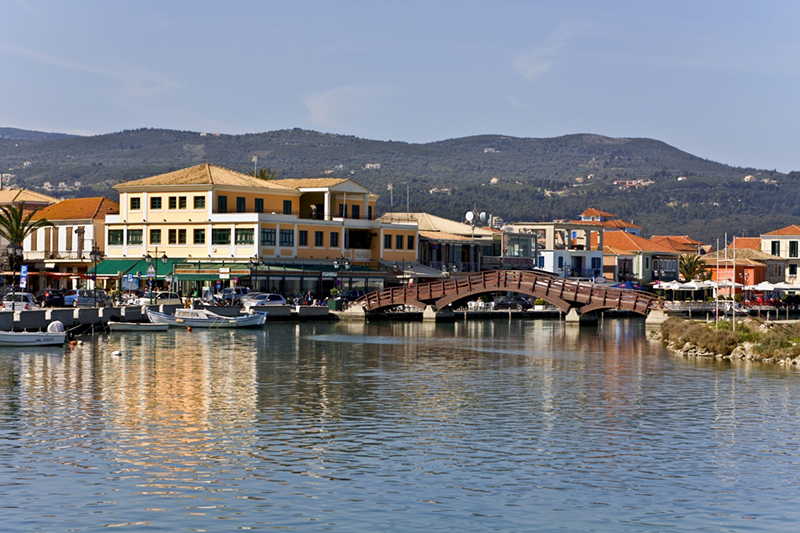 Lefkada is also connected to the mainland of Greece by a bridge, and thus, you can enter the island by taking a bus from the mainland, or hiring a car rental. 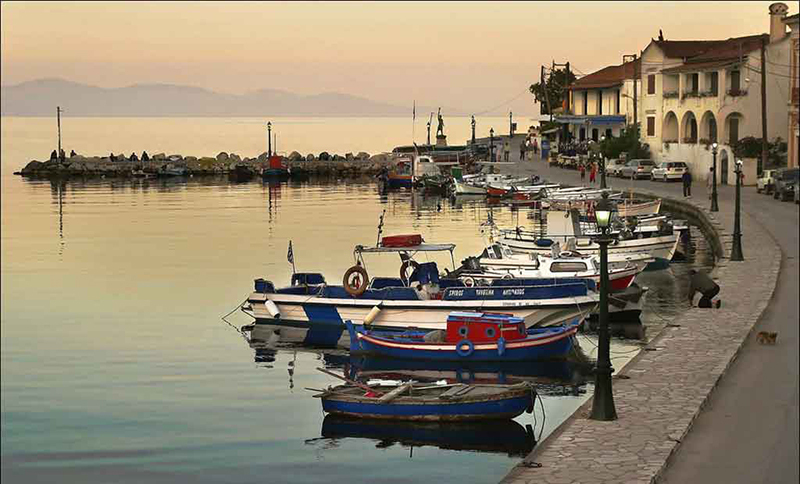 To transfer to other islands, you can take a ferry to Ithaca, which is the closest Ionian island. Ithaca is another popular Ionian island that is known all over the world as the mythical home of Odysseus and Ulysses. In addition to being famous among mythology lovers, Ithaca is an island with laid-back people that is surrounded by beautiful blue-green water and lush greenery that charms any visitor to the island. Ithaca is a small-sized island, and thus might not have many attractions and things to do like its larger neighbors. Ithaca, despite its small size, features exciting attractions and activities, which include visiting its sandy beaches for a swim or a relaxing afternoon. You can also take a stroll and explore the island’s villages, visit the museums (the Archeological Museum, the Folklore and Nautical Museum), or the historical buildings such as the Church of Savior Christ and the Monastery of Panagia Kathariotissa. Why should you visit Ithaca? 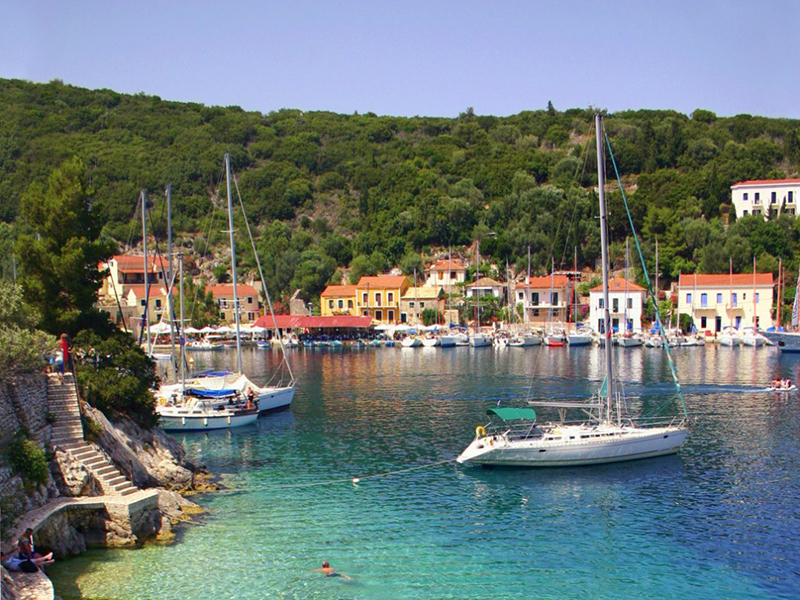 Ithaca is one of the perfect destinations for Ionian Island hopping. To start with, it is a quiet and remote island and thus is perfect for a relaxing or a romantic stay away. While visiting Ithaca, you will also find that there are tons of things to do, which include swimming in the stunning crystal clear water, exploring the villages and towns, enjoying the amazing sunset while taking a stroll along the beach, enjoying the traditional Greek cuisines in the islands taverns, and interacting with the friendly locals. The main means of transport when entering and leaving the island is the ferry service. You can reach Ithaca from the island of Lefkada, using a ferry. After you have enjoyed your stay, you can transfer to the next island, Kefalonia, also by taking a ferry. 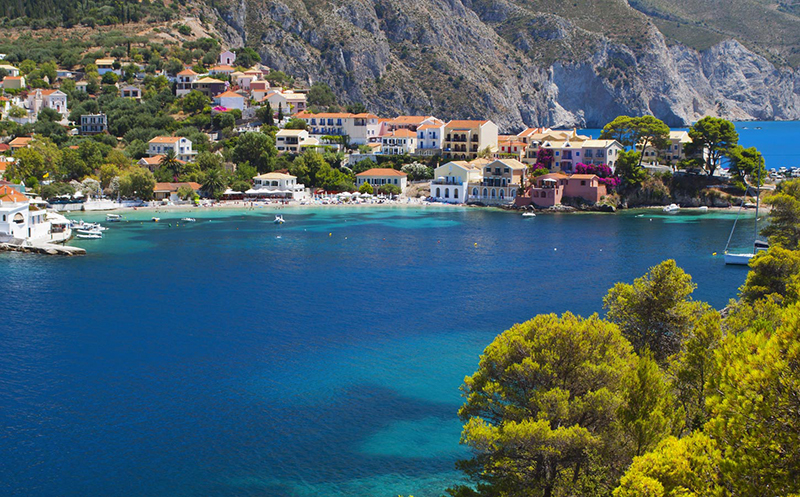 The island of Kefalonia is one of the most sought after destinations in the world. It is famous for the green mountainous landscape, which makes it an amazing destination for hiking. Kefalonia is also well known for its beautiful beaches, which are considered one of the best swimming spots in the Mediterranean. It is the largest island in the Ionian, which contributes to preserve a laid-back and quite atmosphere even during the high season when there are a lot of tourists on the island. Kefalonia is a popular tourist destination, which offers visitors a wide variety of attractions and exciting activities to engage in. These include the amazing exotic beaches, the Sea Lake of Melissani, the beautiful villages of Fiscardo and Assos, Drogarati cave, the Castle of Saint George, the Lighthouse of Saint Theodoroi, and the De Bosset Bridge. 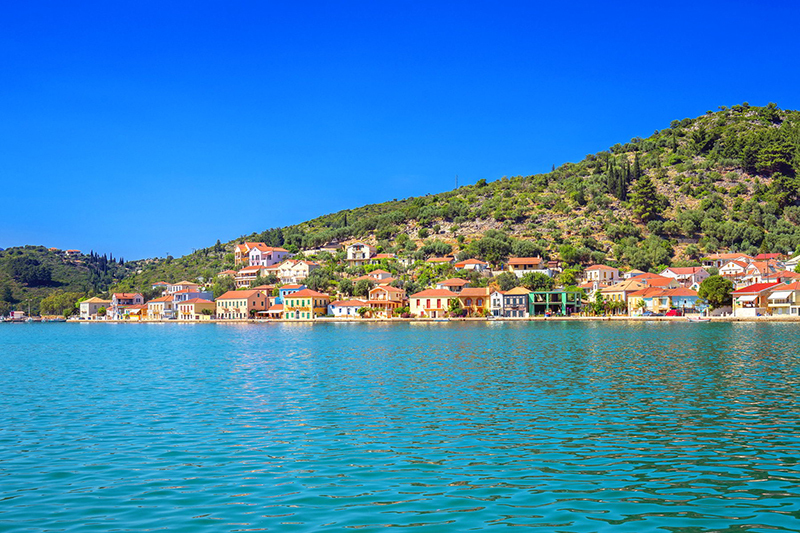 Why should you choose Kefalonia for Ionian Island Hopping? The island of Kefalonia is the number one destination for Ionian island hopping. It is a large and extensive island with numerous tourist attraction sights and activities you can engage in. Due to its large size, the island is also very serene, and there is little chance of it being overcrowded even during the high season. How to transfer from Kefalonia to other islands? 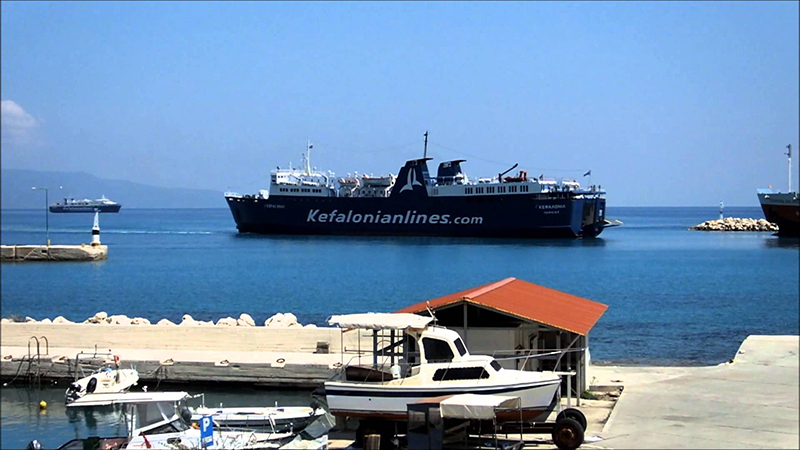 Kefalonia is served by a ferry line, which connects it to other islands in the Ionian. Therefore, you can enter the island or transfer to another one using a ferry. Kefalonia is also served by an airport, which you can use to go back to the mainland if you choose to end your island hopping. With an endless list of attractions and activities to engage in, the Ionian islands are one of the top travel destinations in Greece. The islands are also closely located together, which makes it easier to move from one island to another. That makes Ionian island hopping perfect option for your holidays in Greece.